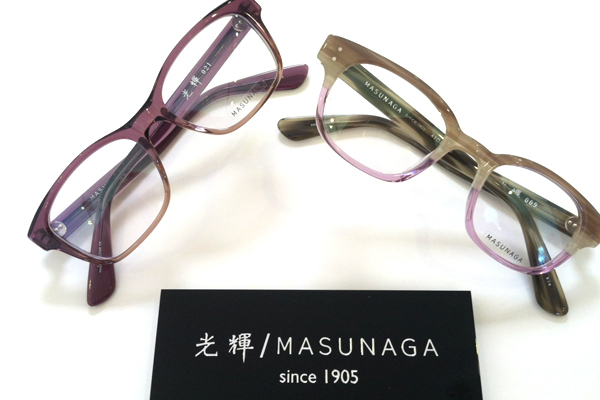 Masunaga has been making eyeglasses in Japan since 1905. The eyeglasses have been worn by generations of emperors and only recently have been made available in the United States. The integrated vertical production process ensures high quality at every step of the way – from design to the crafting of the raw materials and finally to finishing. 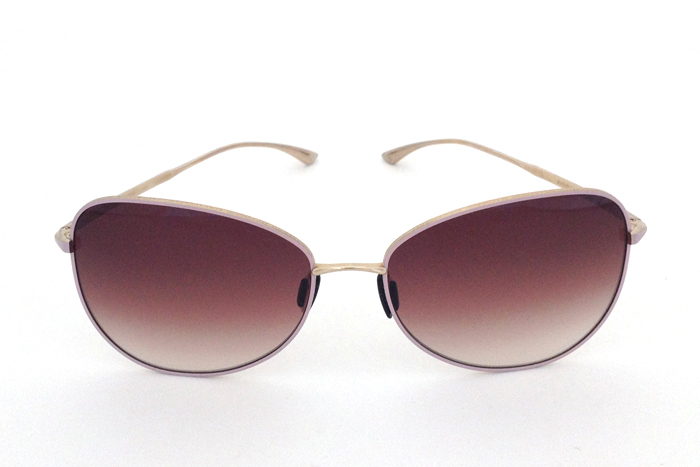 The custom made acetates are characterized by vibrant colors and a rich luster. Kenzo Takada has been wearing Masunaga frames for years, since he was first introduced to them by his optician in Paris. He’s admired the brand for its timeless designs and unparalleled craftsmanship. When Takada gets the opportunity to design a line of sunglasses for the generations old Japanese eyewear factory, the results are amazing. The capsule consists of 6 models, each available in 3 colorways, for a total of 18 pieces. Motives stamped into the rims reference 1920’s watch design and include Kenzo’s family crest, the campanula flower. The collection is made from titanium, which means lightweight and comfortable to wear. 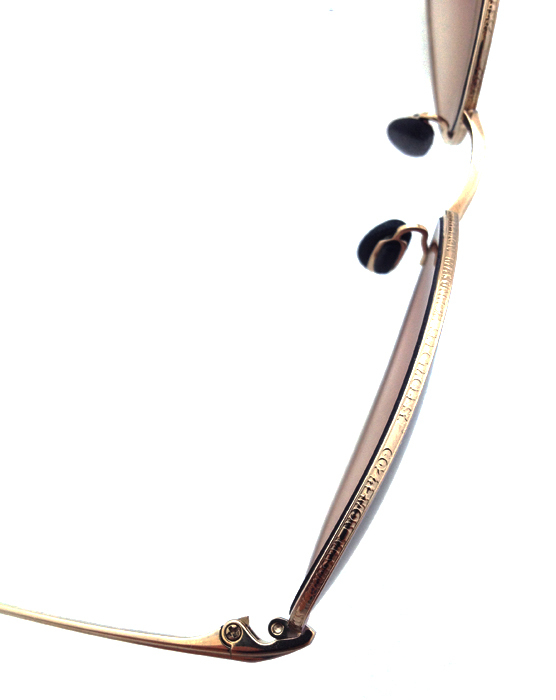 Certain pieces also feature Masunaga’s signature acetates. 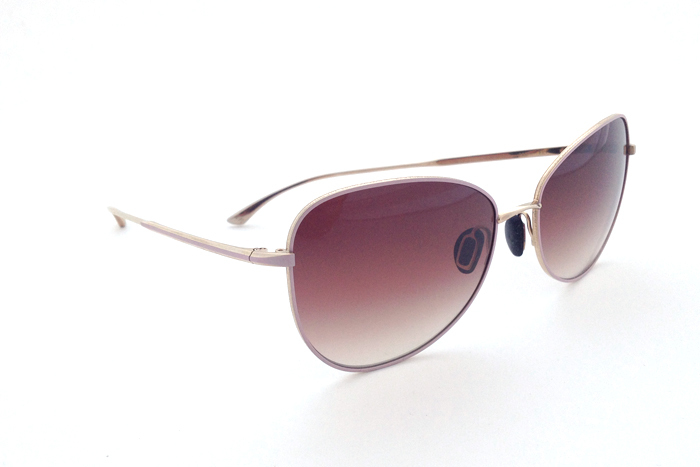 All frames in the capsule include polarized lenses with anti-reflective coating on the inside. In addition to the standard collection, Takada directed the skilled craftsmen at Masunaga to create a solid gold edition by welding titanium onto solid 18K gold segments at the temples, a near impossible task, which they seamlessly execute. A contemporary of Yves Saint Laurent, Takada was one of the architects of the pret-a-porter movement in Paris in the 1970s. He was one of the first male students at the Bunka fashion school in Tokyo and upon graduation in 1964 moved to Paris to make his mark. By successfully selling his fashion sketches he was able to stay in Paris longer than he had initially hoped. In 1970 he opened his boutique known then as Jungle Jap. His designs were known for bright colors and patterns . We are excited and honored to be one of the few retailers of this extremely limited collection in the world. Only 100 sets will be produced in the standard set, with the addition just 5 pieces of each model in the 18k gold. 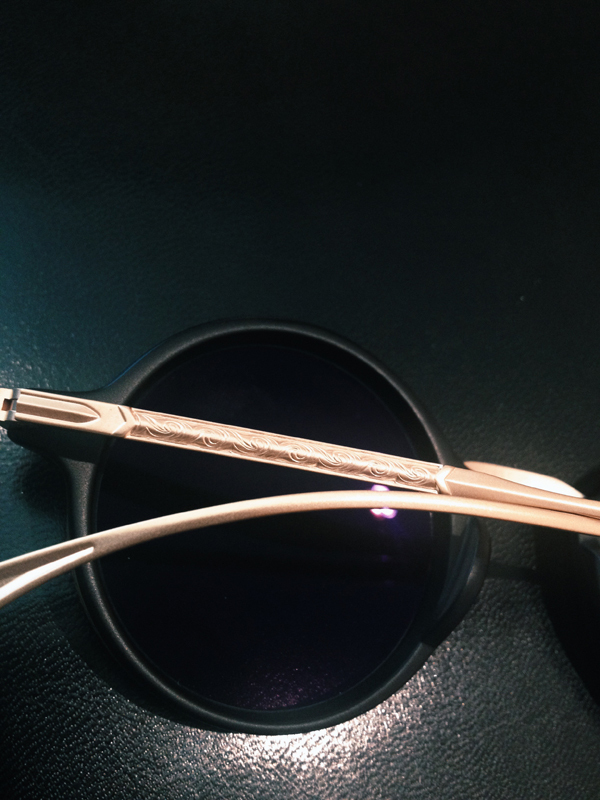 One of our favorite frames in the shops right now, these very pretty sunglasses from Masunaga are exquisitely detailed. A titanium core translates to comfortable and lightweight. The metal is finished in gold with soft matte pink highlights. 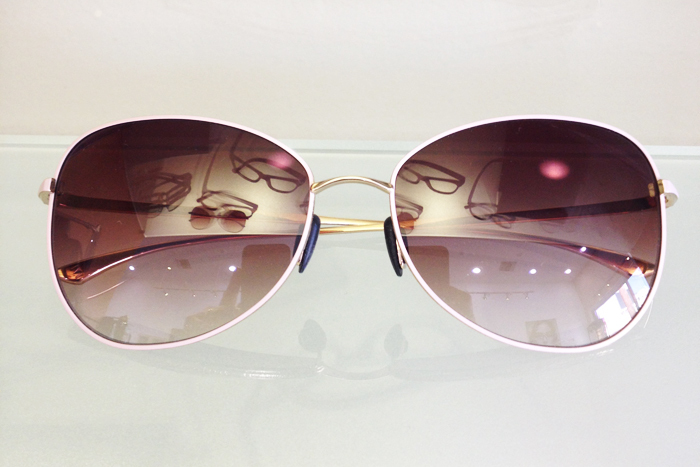 A delicate pink stripe runs down the elegantly contoured temples. 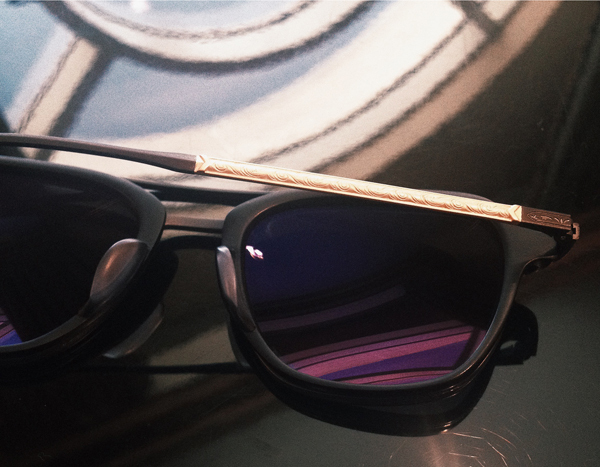 And the icing on the cake – tiny typographic details hand-etched into the metal around the lenses. Recently we caught up with Tom Cody at Vision Expo West, and lucky for us, we had our iphone at the ready! 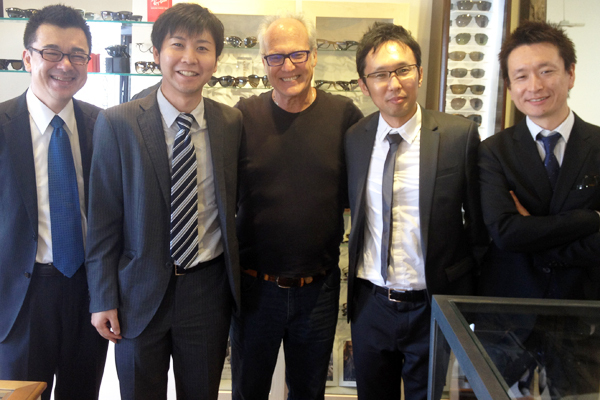 Cody is responsible for (among great things in eyewear) bringing the Masunaga Optical brand, Japan’s the oldest eyewear company, to the United States. Cody tells us the story of how, over 100 years ago, Gozaemon Masunaga, a politician, started with eyewear as a way to bring more work to the people in Fukui, Japan, then a farming community that needed more jobs during the cold winter. Masunaga allowed his best craftsmen to start factories of their own, eventually populating Fukui with a bunch of high-quality workshops, all with roots at Masunaga. They believed that if the quality was the best, then profit would eventually follow. We get a look at some of the details that make Masunaga so extraordinary as well as a sneak peak of what’s to come, including a solid gold classic revisited. Masunaga Optical was started in 1905 by Mr. Masunaga who was actually working as a politician and he was on the board in the city of Fukui, Japan. And during the early 1900s – it was a farming community – and what happened was, there was not work to be had in the wintertime when it was really cold. So the farmers didn’t really have any way to make an income. So what happened was, he wound up hiring all these engineers from all over Japan and he told them to come to Fukui to pitch him on what industries they could start to develop so they could create an income for the community. So what happened was after the meeting with several different engineers from different fields, he felt like eyewear was the best industry to get into. So he started the first eyewear factory in Fukui, Japan, in the whole country of Japan. He told all of his employees if they did the best work with handmade acetate, if they made hinges that were the best quality in the world, that they could leave the factory and start another factory nearby, which no other company would ever do, because they wanted their best employees to stay there. But he really wanted to promote eyewear for the community and build an industry, and he knew that if he had multiple factories in that community, that it would make the community better overall. So every single factory that is in Fukui, Japan, is a direct descendant from Masunaga, which is pretty cool. And there’s a lot of high end factories there, but they all have roots from Masunaga. And what they’re doing is: they don’t care about profit, it’s all about quality. And they figure that profit will come if the quality is the best. In the early 1900’s, in the 30’s and 40’s and they used to custom make handmade frames for the emperor in solid gold, like I was showing you earlier. And in 1970 they had the world’s fair in Fukui, Japan. And what happened was they had a frame that was so popular at the time it was iconic. They put it in a time capsule. And it’s the only eyewear brand that has ever been put in a time capsule, because they wanted something that spoke to the time period and also that’s classy and iconic to represent the eyewear industry. So with this handmade acetate, it’s a seven-barrel hinge, and it’s pretty much built like a tank. They’re polished 2-3 times longer than most high-end brands. They’re hand-polished and also polished with clay, which gets out all the fine lines and little scratches and impurities, so it gives it that a really rich luster. I don’t know if you can tell with the camera but it’s a really deep, deep navy. It just looks really rich. And underneath the plastic…is a core of titanium. Now, we talk talk about the attention to detail with endpieces, etc. The [metal] that’s typically used underneath the acetate is a Monel or a nickel. It’s a softer metal and it’s cheap and inexpensive to use. But what happens is that when you have a heavy frame and you use the Monel or nickel it makes the frame that much heavier. When you use titanium, it makes the frame lighter, but it also holds the adjustment a little bit longer, and it keeps a tight fit so that state doesn’t go back to its original form, which is flat. And then what we’re trying to do is we’re trying to brand Masunaga since 1905. So we etch it out. We do the old-school printing where it’s like an inlay, and we’re trying to show the history of the brand, because it’s truly one of the richest. Everybody’s been coming out with black and tortoise, and it’s nice and everyone wants black and tortoise, but we wanted to create something richer, something with luster, something with personality, something unique, so we’re doing a lot of laminates and gradients that just kind of make things pop. We made this flesh tone, so it almost looks like on the skin it’s semi-rimless so it fades in, so it’s a nice contrast between the red, I would call that like a candy apple red, and the flesh tone of the underwire. This one is a beautiful, beautiful like a blue tort, nice laminate, and it’s actually laminated together to give it that depth and little rich texture. This piece here is one of the first combinations of the p3 shape and it’s made with the old school way they put rivets. A lot of the companies these days cut corners, which Masunaga never does. They’re actually using the true rivets, so it holds together better. And all the acetate is a combination of the titanium. And the titanium is a really hard material that’s really hard to etch. Most companies use Monel or nickel. And this is like the first, the one-of-a-kind, the original. And now all the companies are taking inspiration from this over the years. Everyone thinks, oh well it’s a copy of this, a copy of that. Well, this is the original right here. It’s going to be featured at Dan Deutsch Optical on 3rd Street in Los Angeles and hopefully you can go by and check out the full collection. I don’t look good in round, but I’ll amuse you just to show you. It’s a really clean fit. Most of the frames that are this thin feel flimsy. Since it’s a beta titanium it has a nice flex to it, but also, titanium, it’s hypoallergenic, it’s anti-corrosive, the advantage also is that it’s the lightest, strongest material in the world. There’s not many companies that can make solid gold frames. These frames are solid gold. These are going to retail for $3500.